The A-10 Thunderbolt, a close-air support and ground attack plane beloved by ground troops since its introduction in the mid-1970s, is slated for retirement beginning in 2022, although there is some talk about upgrading the aircraft, known as the Warthog, so its service life could be extended to 2040 or beyond. What to watch: The unmanned MQ-9 Reaper might be able to take on some close-air support missions. While it doesn’t have the same firepower, it has other benefits including the ability to stay overhead for up to 20 hours and to use guided missiles to hit targets close to friendly soldiers. It also is less expensive. 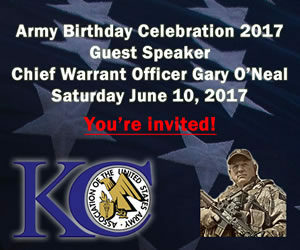 KC AUSA cordially invites you to attend the 2017 Army Birthday Celebration. We will be celebrating the 242nd Birthday of the United States Army. Speaking at the event will be Chief Warrant Officer Gary O’Neal United States Army retired. The event will be June 10th at the Marriott Downtown.